In this tutorial, we will learn how to validate input fields for JSP using jQuery with Responsive layout? There are number of validations on the page before submit, until and unless the user provide the valid details the form would not get submitted. So we are validating the user with these fields. Here we are validating each field as soon as the user changes from one input to the other, and we have kept the form auto complete to off. So that no user details would be auto completed. 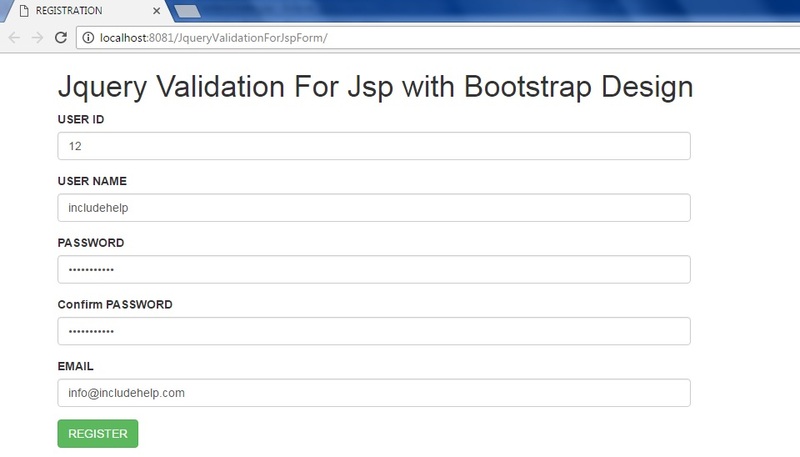 This is the jQuery validation done for every field by getting the ids of the HTML elements. var userid=$("#id").val();   //here we are restricting the user at the time of typing,we called an event "Keyup"
Soon as the user cleared all the validations, the form would get submitted and the success message of bootstrap has been shown.